Several pretty Edith’s coppers (Lycaena editha) were happily nectaring on sulphur buckwheat on the way up to the summit of Grassy Ranch. Just past the intersection where we had turned right to go to Bradley Lake earlier in the week, we turned slightly left onto Road 3810 to cross the crest of the Calapooyas. Just a tenth of a mile down the road, we had to stop again. The road was lined with floriferous spreading dogbane (Apocynum androsaemifolium) for as much as 100′. 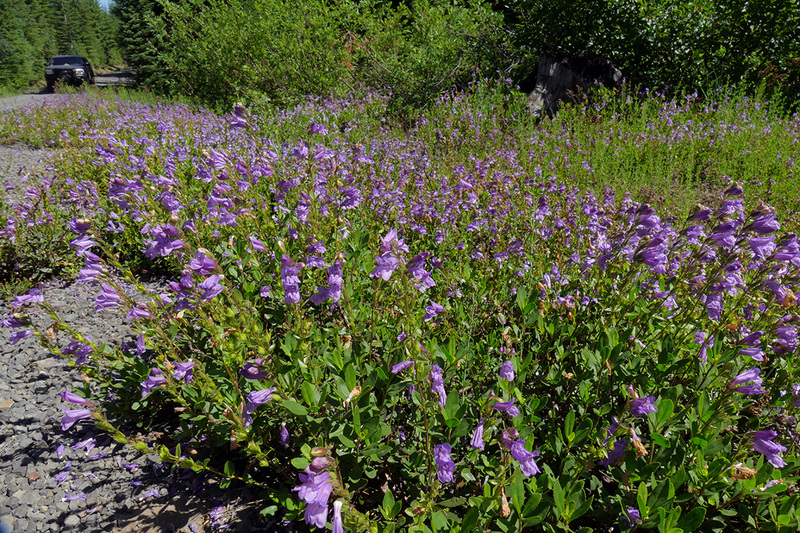 Scores of butterflies were enjoying a Bacchanalian feast on the deliciously fragrant and nectar-filled tubular flowers. This was definitely the plant of the day, both for the butterflies and us. We saw many large drifts along the roads as we continued. The most abundant butterflies we saw on the dogbane were various checkerspots, but there were also lots of Clodius parnassians, fritillaries, painted ladies, orange sulphurs, skippers, and even some moths. The flowering season was much farther along than on “our” north-facing slope, which still had small patches of snow, so over the course of the day, we saw a great diversity of plants in bloom. 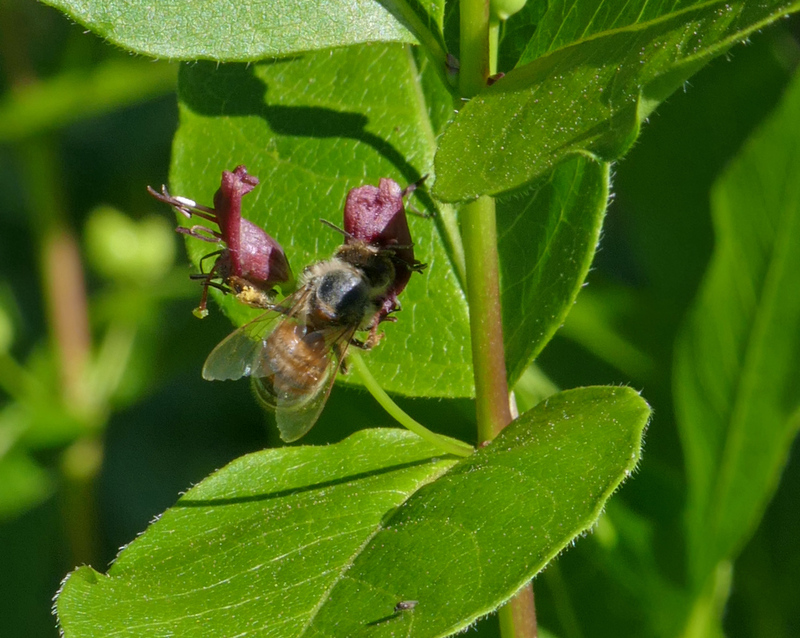 Honey bees seemed to be everywhere. This one was visiting the tiny blossoms of purple-flowered honeysuckle (Lonicera conjugialis) at Grassy Ranch. We finally made it to Grassy Ranch, where we pulled into the small parking area and finally got around to eating lunch. There’s a remnant of a road leading through the meadow to an open summit. Rather than driving around to where a “real” road goes right to the top, I suggested we walk up it. I’d never done that before. It turned out to be one of the highlights of the day. It was only a half mile before it connected with the gravel road. 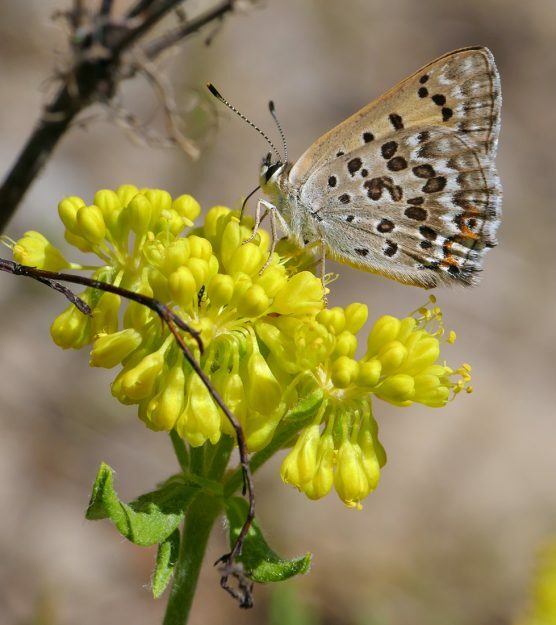 We saw loads of butterflies that were attracted by an abundance of sulphur buckwheat (Eriogonum umbellatum), coyote mint (Monardella odoratissima), as well as more spreading dogbane, all terrific nectar plants for butterflies. The view was outstanding as well. This is one of the few places in the area where there is balsamroot (Balsamorhiza deltoidea), but it is an early bloomer and was already going over. A number of small oak trees (Quercus garryana) grow on the summit and slopes, always interesting to see as high as we were at an elevation of 5500′. 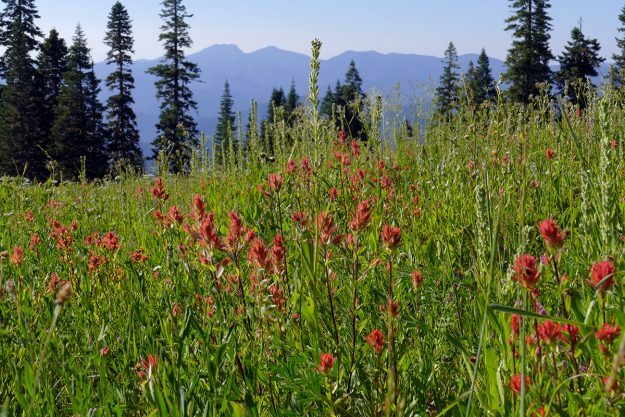 The meadow by the Reynolds Shelter had large areas of scarlet paintbrush (Castilleja miniata). Looking northwest, the highest points in the distance are Bohemia Mountain and Fairview Peak. Butterflies puddling in the damp gravel road. 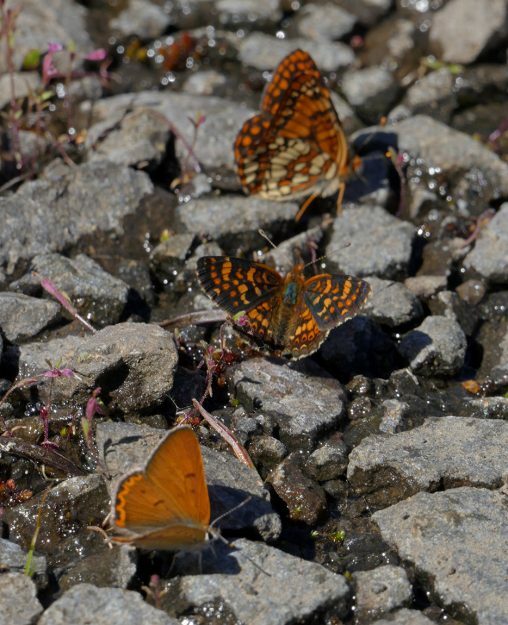 Front to back: lilac-bordered copper, field crescent, and Hoffman’s checkerspot. We returned to the car and drove over to the seepy areas to the south. There were so many butterflies puddling in the damp gravel of the road that I felt the need to shoo them away so we could drive by. We tried to drive to the end of the road, but the road was blocked before the Wild Rose Point trailhead. The roads in general in the area are not in great shape, so we were just happy to get as far as we did. Returning to the main road, we drove the half mile to the Reynolds Shelter. 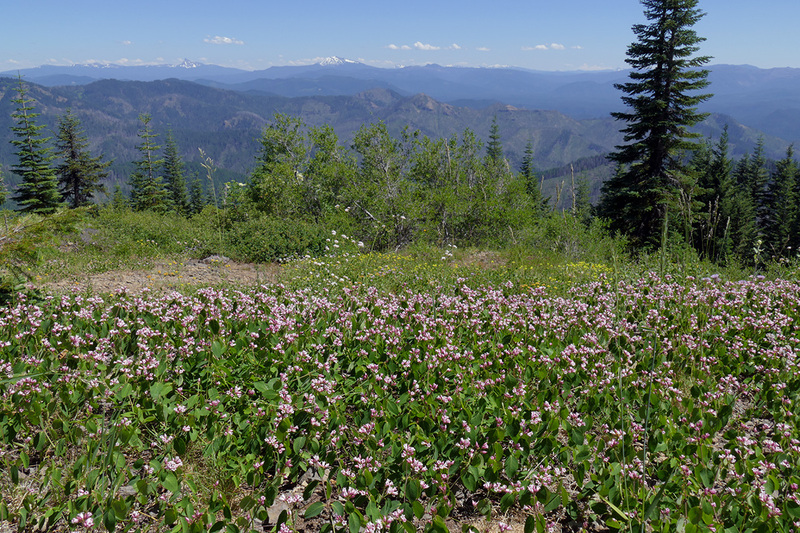 I wanted to see if the Sierra Nevada blues were out in the small boggy spot in the large meadow. It took 10 minutes or so, but we finally spotted a few, looking more worn out than those we had seen at Bradley Lake a few days before. Like the plants, they had undoubtedly been out several weeks longer than those on the north slope of the ridge. It was getting pretty late, but we also checked the larger wetland along the road back to the east. I had never looked for the blues there before but figured they must be there with all the mountain shooting stars (Dodecatheon jeffreyi) and bistort (Bistorta bistortoides). Again, it took a while, but we finally spotted several. It was after 7 pm at this point—how time flies!—so perhaps they were packing it in for the night or it was just too late in the season, but it was good to know they were in this wetland as well. Thanks for sharing your trip. I enjoyed reading about it and wish I’d been there to see all the butterflies and flowers you saw.